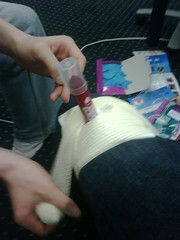 At the weekend, I went on a first aid training course, given by Vicki Clare of Emergency Skills. It was a great day, all attendees learned a great deal. Vicki was a fun, informative teacher, never being too dramatic about the potentially life threatening situations we were discussing (see the pic of the major wound inflicted on my knee). The course was also geared specifically to Film and Television crews, so focusing on head injuries and cuts, the most likely accidents to happen on set or location. I was most amazed by the fact that if you need emergency services and you’re calling from your mobile, dial 112 rather than 999. Dialling this number will pinpoint your location straight away, increasing the response time. None of us on the course had heard about that number, nor at the office. We all qualified as “Appointed Person for Primary and Secondary Care.” This means that for future shoots, we’ll always have someone around who has a knowledge of how to approach with emergency situations, how to give CPR and even (heaven forbid) use a defibrillator. This is nice to know in our profession as more often than not we’re filming in locations we’re familiar with.